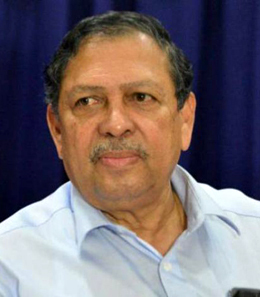 Hyderabad, Feb 22, 2016: Taking a strong view against incidents of people heard raising anti-India slogans, former Solicitor General of India N Santosh Hegde today said he is in "favour" of the sedition law as some "restrictions" are needed to stop people from abusing and talking against the country. The retired Supreme Court judge and former Lokayukta of Karnataka contended that the act of some JNU students, who allegedly termed the execution of Parliament attack convict Afzal Guru as "judicial murder" and raised anti-India slogans, "definitely amounts" to sedition. "I believe in sedition law. I am a patriot. Any patriot cannot go on abusing the country. There are certain parameters," the former Karnataka Lokayukta told PTI. JNU Students Union President Kanhaiya Kumar was arrested on sedition charges earlier this month. Five students, accused of sedition and missing for days, surfaced on the JNU campus last night. "Many people think differently in this country whose allegiance is with some other country or some other group..if democracy has to survive, then there should be some restrictions on the people talking against the country. "Forget all other things. You criticise the government, criticise the individuals, criticise the system. Patriotism can never be criticised," he said. Hegde said he does not believe in the previous judgement of the Supreme Court that says mere talk is not sedition and should be followed by actions, something contrary to law. "I don’t believe in that judgement. Sedition means propagating some views which are against the nation. As long as the judgement of the Supreme Court is there, I am bound to say its the law of the day today. I am one of those persons who would say that the judgement should be changed," Hegde said, citing events in JNU after the February 9 controversial event, including violence in Patiala House. "You can’t meddle with patriotism. Everything is alright (but) patriotism can never be compromised," Hegde said. He strongly sought to counter those who favour junking the century-old sedition law saying it’s an archaic legislation and a relic of British colonialism.